Time for some LMM giveaways in conjunction with the Lucy Maud Montgomery Reading Challenge. Have a copy of Jane of Lantern Hill ? Would you like one? Simply leave a comment below. In case you are unfamiliar with this particular story, here is my review. This contest is open to US and Canadian residents and will remain open through Sunday, January 12th. You may leave a second comment if you are participating in the challenge and have stated so in this post. THIS CONTEST IS NOW CLOSED. THE WINNER (as selected by Random.org) IS #14 - Starwood Quilter. Congrats! This is one I'd love to read but never gotten around to. Thanks for the chance to win! I am a recent reader of LM having only read, and fallen in love with the Anne books in the last few years. I'm 37! Love, love her writings. It'd be great to have more for my collection. I am new to your site and look forward to reading more. I Love the Anne books but never really ventured to read any of LMM's other writings.Because of your challenge, I have begun to read The Blue Castle. Thanks so much for sharing. Squee! I'd love to win a copy -- this is one I've been wanting to read, and can't get my greedy little paws on :) Thanks for the chance to win one! I've just finished Blue Castle and have read all of the Anne series - some more than once. 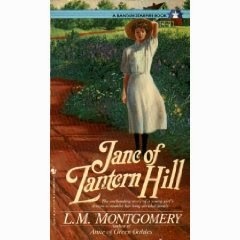 I've never read Jane of Lantern Hill so would love the chance to win it. I've received one comment so far about it! I'm not doing the challenge this year - just too busy to add one more thing, but I'd love a copy of this book, as I don't own it yet. I hadn't hear of this book, but I would love a chance to read it. Thanks for having this giveaway. I am part of the LMM challenge. I'm currently reading The Blue Castle for the first time and am feeling so sad for Vallancy!